What are the New rules of EPF Withdrawal? As per new EPF rule notified on 10th Feb,2016 by the government, full EPF withdrawal is not permitted till retirement age. 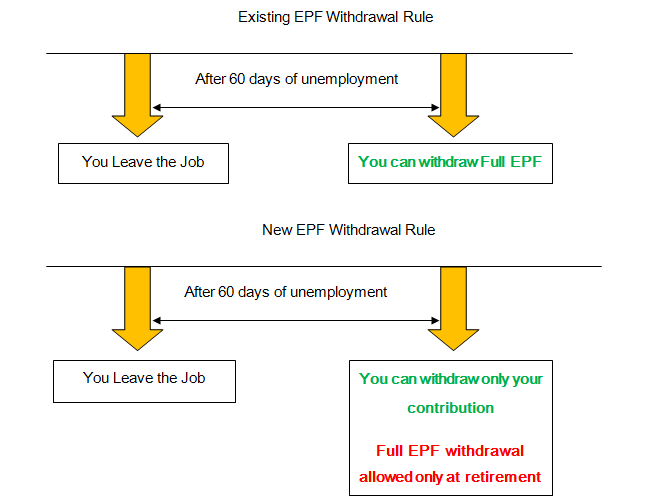 If a person is unemployed for 60 days and wishes to withdraw EPF amount, he or she is allowed to withdraw his or her own contribution and interest earned on it. The contribution of employer and interest earned on that can be withdrawn only at retirement age 58 years. So, if you want to utilize full EPF corpus for starting your own business before retirement you cannot. As full EPF withdrawal is not allowed now, an individual member can continue with same UAN Number after withdrawal of his or her own contribution. 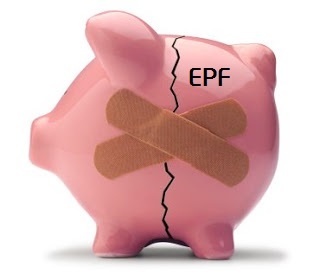 EPF membership will continue until the retirement age of the member. A retirement age as per new EPF rule is 58 years. As per new rule, you cannot withdraw 90% of EPF balance on attaining 54 years. New retirement age is 58 years means you can withdraw 90% of EPF balance only on attaining 57 years of age. Why EPFO has postponed implementation of new EPF Withdrawal Rules? No readiness in calculating and settling only subscriber contribution. How to identify this account as an operative, as it will become inoperative if no transaction are made for 3 years. If a person finds a job after 60 days same UAN number is to be given or not. The people who have recently left their job and planning to start own business can take advantage of this stop gap arrangement and can withdraw Full EPF amount. As per new circular all claims received up to April 30, 2016 are to settled as per the provisions existing prior to the issue of the notification dated February 10, 2016. As per my opinion the government should withdraw this rule on immediate basis. If the government can not provide social security to anyone they don’t have rights to make such unjustifiable rules. Let people manage their hard earned money. They are the best judge what to do with their money. Hope all of you agree with me. Please voice your opinion by sharing this post with everyone. What is your take on this new rule of EPF withdrawal? Do you think the stringent rule of EPF withdrawal will help you in building your retirement corpus? Do share your thoughts ideas in the comment section. Hi Raviraj, I worked in the company for 4 years. Can I withdraw my full PF ? Is this above rule in place. Yes above rule is discarded.You can withdraw your EPF. If you are not likely to do job in future you can withdraw full PF. Have Been following most of your recommendations for past 6 months. Thanks and god bless u and your wise counsel. I had been with a company for since 4 Oct 2010 and was laid off on 27 Jan 2016. Can i withdrawal my portion of the PF without an tax liabilities. You can withdraw entire PF amount without any tax liabilities. is this rule implemented now? I feel that our Govt. should withdraw this rule immediately. We, the people, know how to manage our benefits and the govt. cannot impose such things on us. CONCLUSION WILL BE MADE BY ANY AUTHORITY, BUT DECISION IS NOT MADE BY ANY AUTHORITY,BECAUSE MONEY BELONGS TO NOT A GOVERNMENT, ITS OUR MONEY, DON’T BLAME SILLY. NO ONE HAVE RIGHTS TO HOLD EMPLOYEES PF FUND(EMPLOYEE+EMPLOYER+INTEREST).